Motorists queue for fuel at a filling station in Harare. 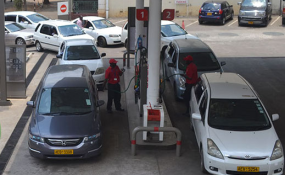 "The fuel supply in the country is stable and the public should not panic based on false statements that the fuel prices are due to be significantly reviewed," he said. "Government has put in place enough financial facilities to ensure that there will be enough fuel stocks to cater for current demand. "There is no need for panic buying. The country has adequate stocks. ZERA is constantly monitoring the supply and consumption patterns while the financial side is being resolved by the central bank."